As part of the Paris Motor Show 2016, Volkswagen unveiled an electric car concept. 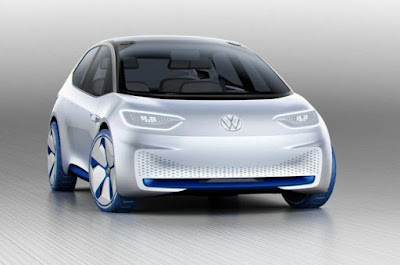 The VW ID is expected to go into production in 2020 and deliver a range of up to 600 kilometers. According to the manufacture, the "ID" is the first model of a "completely new fleet of innovative electric vehicles". The exterior of the new car is a little reminiscent of BMW's i3 - this has already been on the road, contrary to Volkswagen's concept. In contrast to the i3, which runs about 300 kilometers with a battery charger, the ID from VW runs between 400 to 600 kilometers, without having to go to a charging station. The battery will be charged within 15 minutes. The vehicle is powered by an electric motor with 175 hp (125 kilowatts). According to Volkswagen, the VW ID is the first vehicle to be based on the Modular Electrical Building Box (MEB) specially developed for electric cars. VW is already preparing its new car for the era of autonomous driving: From 2025 the car is also to be fully automated. In the so-called "I.D. Pilot" mode the multi-function steering wheel is retracted - the car then takes complete control. In addition, the interior has been redesigned according to an "open-space" concept, so that more space is available to the occupants. Volkswagen has set itself the goal of selling one million electric cars per year from 2025 onwards. In addition, the plan is to bring up to 30 fully electric new vehicle models to the market. Volkswagen is not alone in the direction of electric cars with its strategic move towards the electric car market. Among other things, BMW has fully committed itself to electro mobility. The ID is expected to cost as much as a comparable diesel motorized golf - that would stand today about 30,000 euros.